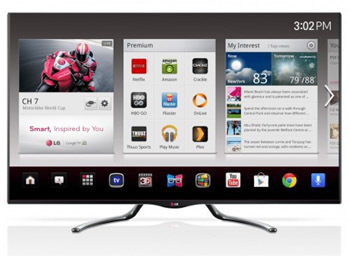 This is part of LG's expanded line of LED televions equipped with Google TV along side the standard LG Smart TV features. This broadens the functionality of the 47GA6400 greatly. Google TV adds the full Chrome web browser, deep search features, voice recognition and more to your TV, making for a fuller online experience to your living room. This TV even has access to the Android marketplace so many apps you on a smartphone or tablet can be run right on your TV. Picture quality on the 47GA6400 is very strong for a mid tier LED TV. The bright LED backlights push a lot of light through the panel to create bright and clear pictures. Excellent light flow-through is one of the highlights of this TV. Peak whites are very bright as well. Colors are another strong point as they are presented in a very natural way after dialing in a good calibration. Color rendition isn't over saturated as we have seen on a lot of current generation LED TVs. Black levels and dark shadow detail are where the GA6400 does fall short. Blacks don't measure up to the levels of a decent plasma or an upper tier level TV and dark shadow detail leaves a bit to be desired. This TV produces an excellent overall picture when viewed from front and center. The 47GA6400 is not a major offender in this area, but it has its downside. Note, we have seen far worse this year. Color and contrast begin to degrade at about the 25 degrees of center mark. This applies to horizontal and vertical viewing angles alike. Take note of this in case this TV is going to be wall mounted or placed in a room where front and center viewing is hard to achieve. This is one of those features that will have to be turned on or off depending on the content being watched. The best use of it lies in live sports programming to take full advantage of the 120Hz panel to smooth out the fast action. Film based content and TV programming are best with this setting disabled. Disabling this feature gets rid negative by-products like the “soap opera” effect and reduced natural background blur. We found that the User setting with De-Judder at 0 and De-Blur at 10 produces a great middle ground between the two. In the end, it is important to try out all the different ways to see which you like the best. We have been very impressed with the passive 3D technology LG has put into their TVs this year. I honestly have preferred it. The picture remains as bright and clear as Full HD 2D images (even though there is a reduction in resolution due to the tech). Try to get an active 3D TV to do that. The perception of depth is also very strong. The glasses are cheap, comfortable, and light. Unfortunately, we couldn't really test the streaming 3D content through the TVs Smart menu very well due to lack of processor power in the TV. But with 3D Blu-ray content the TV displayed a great amount of depth, rich colors, and good contrast. 4 pairs of glasses are included in the box. This is a great TV for 3D lovers. Smart TV made a lot of progress in 2012. From what we have seen, we thought LG has been a pretty solid contender. Mix a well established platform with power of Google TV to the 47GA6400 and the possibilities are endless. An updated Home Dashboard includes apps like HBO GO, Youtube, and many other choices to bring you the best content at any moment. LG also included a very cool feature that will make the day of any gamer. OnLive, a streaming gaming service, is installed out of the box granting access to a large library of games. The days of the dedicated gaming console just might be numbered. It's a great app and it's nice to see LG incorporating it into their TVs. See the following page for a full review of LG's Smart TV Platform. The LG47GA6400 screen does not have the Cinema Screen design that the higher end LG LEDs are equipped with. The bezel is a little wider, so you miss out on the floating image illusion. The LG 47GA6400 steps up to be an excellent value for the size and features it has to offer. An $800 price tag delivers a feature rich smart TV platform, top tier passive 3D performance, and great sounding speakers. The Samsung UN46F6400 sells for more and falls short by one inch of screen space. the Vizio M471i comes close at $100 less but loses the passive 3D playback. TV without stand (WxHxD): 42.76" x 25.7" x 1.43"
TV with stand: 42.76" x 28.11" x 11.22"